I love Florida. While the rest of the country is stuck in freezing temperatures, the first indications of spring are here in Jacksonville. The robins have returned along with other migratory birds and the lawn needs mowing for the first time this year. On the other hand it's a harbinger of things to come, sweltering in the heat when it's 90+ degrees outside and dripping with humidity. I'm not to fussed though. After 3 years in the Philippines even the hottest days here in Jax are like a vacation from the near equatorial swampiness of Davao. One of the most important lessons I learned was protect yourself from the sun. It's brutal in the Philippines and worse (yes I said worse) in Jacksonville. I never sunburned in the Philippines unless I spent a day at the beach but here in Jax I can burn just walking to the mailbox. It has something to do with the angle of the sun which creates a higher UV index in North Florida than it does down south. So cotton luau shirts and slacks are my outfit of choice in the summer, and top it all off with a hat. People used to wear hats way back when, now the height of fashion is tshirts. 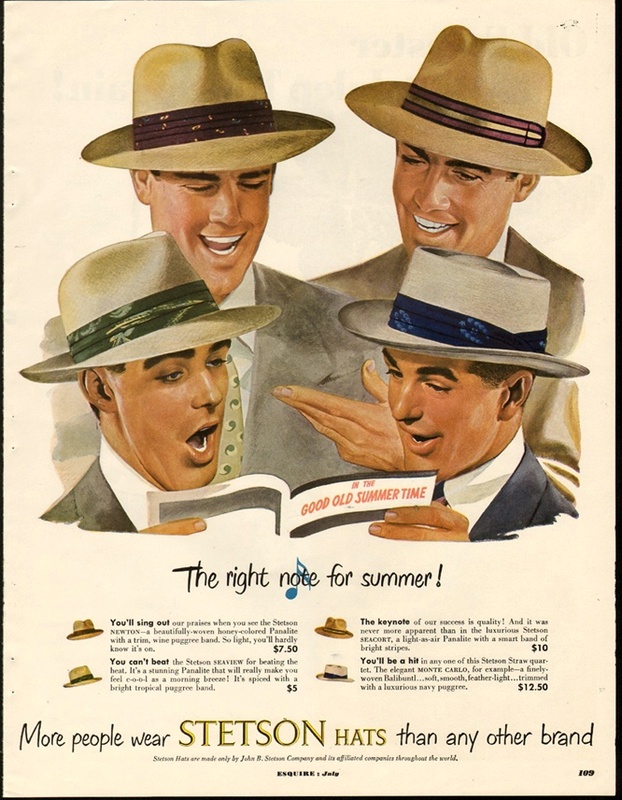 This particular Stetson ad dates from 1950 when hats were still in vogue. Somewhere along the line we lost our way and hats were tossed aside eventually being replaced with the ubiquitous baseball cap. Don't get me wrong, baseball caps are all well and good if worn correctly, but they do nothing to protect the back of your neck from the sun and if the wearer is dressed up, topping it with a baseball cap is a comical affectation. So I advocate the return of the straw panama as in the ad above. Works with a variety of outfits and is far cooler and more UV protecting than a baseball cap. 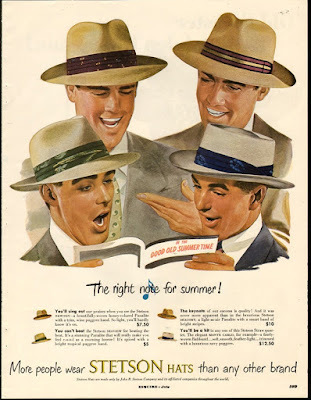 Personally I'd take all four of the hats in the ad, you just can't find hats with ribbons like that anymore and they're just snazzier than a plain old baseball cap and would look cool with a pair of raybans on.